I've been spending more time working on the computer... with none else to keep me company than Mickey and Moosey. But they recently got themselves a little new friend, Lucy. No, of course Lucy isn't mine, she's my little baby niece's doll that she left behind the last time she visited. 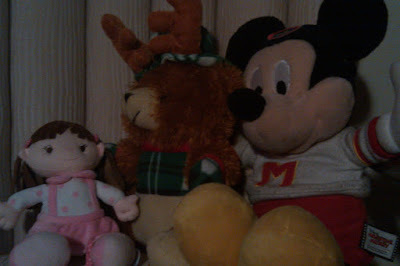 Mossey joined Mickey not too long ago, he was given to me by Apo Jay Rich back in the days where we could still hang out without school blocking off our days. And Mr. Mickey was my mother's, she used to drive with him on the back seat for some reason, and for some other reason, she just gave it to me out of the blue... now this was before I became a Storybookland Storyteller. They keep me company and sane... lol REALLY?